Street parade attracts impressive numbers. 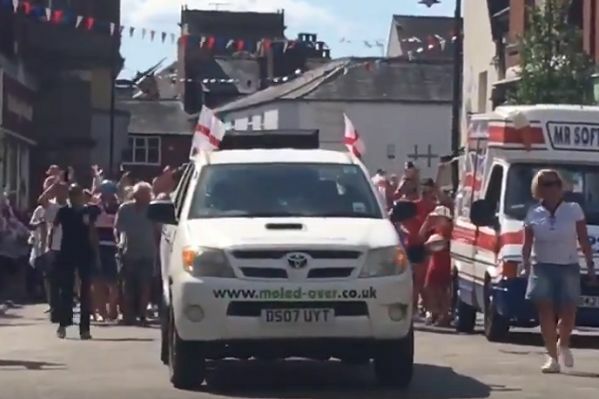 These were the scenes in Leek as hordes of England fans marched behind a car playing Vindaloo and sang along with gusto. It may not quite be Three Lions but the 1998 World Cup song by Fat Les has managed to endure, as demonstrated by all the people belting it out in this clip. Quite how long the impromptu street parade went on for is not entirely clear, nor is the effect it might have had on local traffic. England play Croatia in the World Cup semi-finals on Tuesday, with the winners playing France or Belgium in the final of Russia 2018.